Adelaide City ran amuck with a 4-2 win in last night’s Grand Final rematch against arch rivals Metro United in Round 5 of the WNPL at VALO Football Centre. Games against Metro United have always been physical and highly entertaining, and it delivered again in the top-of-the-table clash last night. The Black and White’s strong and clinical performance now see them clear on top of the ladder by three points. Metro drew first blood within the first 10 minutes, when Chrissy Panagaris headed in the goal off the back of a corner kick, after City failed to clear their lines. City had their best opportunity for an equaliser at the half-hour mark, when Tiarn Powell latched onto a poor pass between the Metro defence and caught their keeper off her line. However, her strong strike strayed just wide of the goal. City’s reply came just a few minutes later, when Chelsie Dawber was bundled down in the box. She converted coolly from the spot, placing a mark on her first game back in the starting line-up. 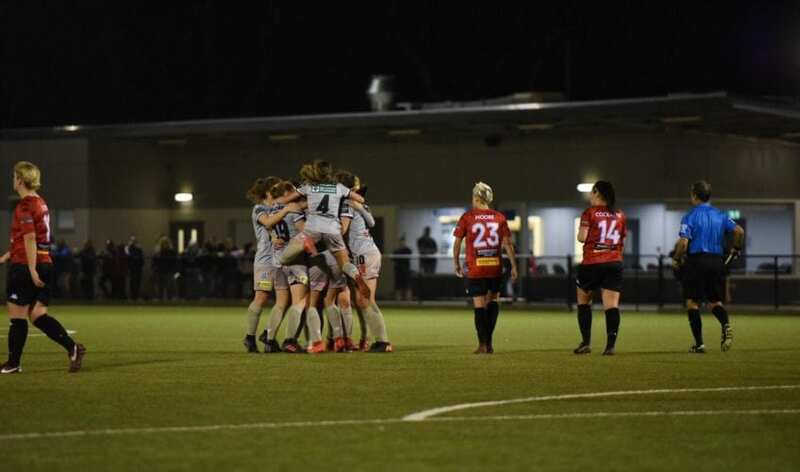 Georgia Campagnale ensured that City headed into the sheds during half-time on the front foot, by scoring a stunning free-kick goal from outside the 18-yard box to make it 1-2. Whilst the first half saw relatively even actions by both teams, City went back into second half looking more dominant and threatening out of the two. Tiarn Powell finally got on the scoresheet in the 67th minute, when she got onto the end of a defense-splitting pass to slot a goal into the bottom right corner, past the outstretched hands of the Metro ‘keeper. It is not an Adelaide City game without a Daniela Di Bartolo special – she put the final nail in the coffin when she went on a solo run past her defenders and put the ball at the back of the net with a fiery strike. Metro’s Panagaris pulled a consolation goal back right at the dying minutes of additional time when she volleyed a pinpoint cross from Stella Rigon past goalkeeper Kendall Jenner. However, it was not enough to dampen the spirits of the City team, and provided some great entertainment for the audience on a chilly Friday night. Daphne McLeod shared her thoughts on the 4-2 win post-match. Adelaide City will play against West Adelaide next Friday, 8:00PM at West Beach Parks Football Centre.